Although Israel is quite an occidentalised country, we rarely get bands from this Near East country making it to the West. One of the reasons may be that especially their male population has to spend quite a lot of time in their armed forces. And when some of their more popular artists happen to make a breakthrough, the result can be very ambivalent, like in the case of prog rockers Amaseffer whose bible stories were not up to the taste of this secular homepage. Fellow proggers Ephrat, formed by guitarist and composer Omer Ephrat, also in charge of the brilliant production, fares already much better, possibly because they don’t try so hard to sound like an Eastern band. With a mix and mastering by Porcupine Tree’s Steven Wilson and some help from Swedish vocalists, they end up sounding more like a modern Scandinavian prog rock band, which turns out to be an advantage eventually. Their debut No One’s Words starts quite traditionally with the ten minute long The Show which combines classical hard rock à la Deep Purple, Jethro Tull and Rush with more contemporary metal sounds. This is followed by Haze, one of two extraordinary highlights. The songwriting is weirdly dark and angular, to say the least, and guest vocalist Petronella Nettermalm (Paatos) transforms this track into a moody trip prog extravaganza. Things can’t become better than this. Better Than Anything continues the way the opener started: complex hard rock music with so many variations it’s hard to count them all. The instrumental Blocked, only piece shorten than five minutes, leaves some space for exhaling, before Pain Of Salvation’s Daniel Gildenlöw takes over lead vocals on the five parted The Sum Of Damage Done, an exquisite ten minute long track which is only surpassed by the nineteen minute final epic Real, the other incredible experience which collects everything that prog rock ever stood for, becoming a mini-operetta of crazy proportions. Where many long-tracks use length just for length’s sake, this one doesn’t waste time on unnecessary upholstering. 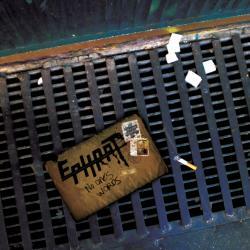 Ephrat succeeded splendidly with their debut No One’s Words. Half of the album presents far above average progressive hard rock, and the other half is pure genius, resulting in fat nine points. Although it must be conceded that producer Steven Wilson’s hand is more than obvious in the overall result, even though Porcupine Tree would be more than happy to come up with such an impressive piece of music.